If classroom teachers are to meet the need for meaningful integration of technology in educational settings, there must be a restructuring of both teacher preparation programs and current classroom practice. The purpose of this paper is to share the progress of a collaborative partnership between an urban school district and a college of education to support practitioners’ ongoing professional development and to inform teacher education practices around technology at the college. A Teacher Inquiry Group (TIG) consisting of a group of classroom teachers and other school and district personnel, along with teacher education faculty members, met over a two year period to study, share, and expand best practices for integrating technology into K-8 and college classrooms. Data gathered from TIG participants and others from the school district and college indicate that this collaboration has had a significant impact on both partner institutions and has great potential to widen that impact in the coming years. Murphy, K., Richards, J., Lewis, C. & Carman, E. (2005). Strengthening Educational Technology in K-8 Urban Schools and in Preservice Teacher Education: A Practitioner-Faculty Collaborative Process. 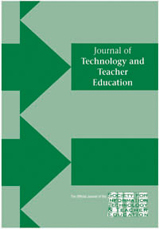 Journal of Technology and Teacher Education, 13 (1), 125-139. Norfolk, VA: Society for Information Technology & Teacher Education. Retrieved April 20, 2019 from https://www.learntechlib.org/primary/p/4408/. Dewey, J. (1964). John Dewey on education: Selected writings (R.D. Archambault, Ed.). Chicago: University of Chicago Press. Duckworth , E . (1986) . Teaching as research . Harvard Educational Review , 56 , 481-495 . Fulton, K. (2003). Redesigning schools to meet 21st century learning needs. T.H.E Journal, 30(9) , 30-36. Garner, B. (1996). Using action research: Challenges and opportunities for the beginner. Paper presented at the Greater St. Louis Sixth Action Research Collaborative Conference, St. Louis, MO. Gilbert, S. (1995). Teaching, learning and technology: The need for campuswide planning and support services. Change, 27(March/April), 46-48. Haugland, S. (1995). Classroom activities provide important support to children ’s computer experiences. Early Childhood Education Journal, 23(2) , 99-100. Haugland, S. (2000). Early childhood classrooms in the 21st century: Using computers to maximize learning. Young Children, 55(1) , 12-18.
International Society for Technology in Education (ISTE) (2000). National educational technology standards for teachers. Eugene, OR: ISTE, NETS Project. Johnson , B . (1993) . Teacher-as-researcher . ERIC Digest 92-97 . Wash ington , DC: ERIC Clearinghouse on Teacher Education . Lampert, M. (1988). Teachers’ thinking about geometry: The effects of new teaching tools. Technical Report 88-1. Cambridge, MA: Educational Technology Center. National Education Goals Panel. (1995). National education goals report: Building a nation of learners. Washington DC: U.S. Government Printing Office. Office of Educational Technology (1996). Educational technology: Tools for transforming teaching and learning. Washington DC: United States Department of Education. Poole, J. (1998). Schools have their computers, now what?. T.H.E. Journal, 26(5) , 60-61. Pytlik , E . (1997) . Conducting qualitative research in the classroom . Technology Teacher ,56(6) , 20-21 . Rogoff , B. (1990). Apprenticeship in thinking: Cognitive development in social contexT. New York: Oxford University Press. U.S. Department of Education. (1999). Preparing tomorrow ’s teachers to use technology. Federal Register. 34 CFR Part 614. [December 28] Washington, DC: U.S. Department of Education.